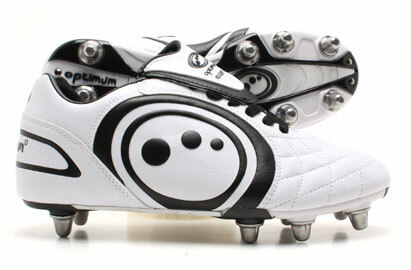 Eclipse SG Rugby Boots White made by Optimum. Pro-Performance soft, durable PU upper with 240D nylon lining for reinforcement and support. - Full foreboot panel for improved fit and comfort. - Full toe box profile for playing comfort. - Full board lasted construction for comfort and support. - A Velcro grip under the tongue provides a larger and cleaner kicking area. - Outsole is an 6 stud(Junior) or 8 (Senior) screw-in Bi-Colour Injected Polymer unit.